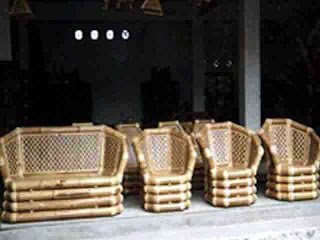 Mebeler bamboo which initially merely was complement of housewares of rural household, have never been peeped at public. But the reality now becomes other, because mebeler bamboo can go up pamour, even becoming not embarrass when perched in prestigious houses. Change of the public appetite of course do not come abrupt, but through covering ground process. If ditelisik, the process doesn't release broil from Mr. Kartodimejo, a perajin bamboo of countryside Cebongan, Sleman, Yogyakarta trying to produces chair from bamboo material wulung ( black). The scorpion, around year of 1970 s(he still still besimbah sweat nyunggi must ( brings above head) chairs his creation, from countryside by foot towards town Yogyakarta is aparting around 15 kms. Even consciousness a lot has not enthuses it, Mr. Karto his(its non bored fringing town road(street Yogyakarta to vend its(the merchanidise. Today saleable one, tomorrow do not find buyer, and has just around four, the next five days of payon again, so(after about image of its(the journey. Aphorism basin do not recognized hence non darling, mebeler the scorpion bamboo of course still unheard-of of wide, palagi is darling. Has just a few the next years in edge of street Suryotomo/Lojikecil, Yogyakarta, there is an agent mebeler strarting bamboo performs its(the merchanidise in cloister. After the time/date of that is public Yogya gradually recognizes it, until finally many buyers, even merely to be attached in house terrace;core, or receive children guest boards with. 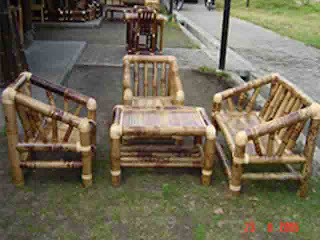 When has run flogs the next year, then mebeler really bamboo can enliven furniture market. Kreasi and innovation perajin also grows, from initialy artless then dikutak  tick with engraving. Even not only limited to guest chair desk, but other product for example sketsel, bed, book rack and his(its conspecific, starts emerging in marketing. In few words mebeler bamboo like entering a period of booming, Mr. Karto also have been followed by many perajin its(the neighbour. Since a few years lately, countryside Sendari, Cebongan, Mlati, Sleman turns into ( a kind) sentra [crafting/ diligence] of bamboo entangles tens of perajin. Local Government of Sub-Province Sleman also intervenes facility for example with segaramisation of business nameplate, and supply of farm in spacious a pice of land owned local kalurahan. Even must rent around Rp 1 juta/tahun, perajin-perajin like Hartono, Muryadi, Sugiarto, Sukidi, Ninik feels is steadier with its(the business. Different with Mr. Karto which berdarah-darah must, now perajin ready to open kios/toko, buyer has come x'self looks for it. Its(the excitement is again, buyer is not merely from in around Yogyakarta, but also from other towns, even world. Ninik, with nameplate effort for Deling Asri for example, confess has the several exporting to Portugal and Phillipina. Similar export also done by Sugiarto, to Italian, Dutch and Germany, or Muryadi have ever exported British krypton, Swiss, Spanyol, American, Korsel, Turki, Austrian, Singapore, Taiwan and Malaysia.